The late 1920's would have been an exciting time to be a single young man in Southern California. The Jazz age was still in full swing, and there were plenty of pretty girls about. Los Angeles had yet to experience the explosion of growth it would see during the War years, but it was a big enough town to attract all the amusements one would expect back East. However, there was enough of an "old West" feel to the landscape that a fellow could let his guard down and cut loose from time to time. Marion Mitchel Morrison had been born in Iowa, 1907, but his family settled in Glendale, California, in 1916 where his father made a decent living as a pharmacist. He was given the nickname Duke by a fireman whose station he passed on his way to school, had a job in a soda fountain, and played for the league-leading 1924 Glendale High School football squad. He tried to get into the US Naval Academy but was not selected. Instead, he entered USC to play football under coach Howard Jones. Morrison became good friends with lineman Wardell Bond, born in Nebraska, 1903, but grew up in Denver. The pair found plenty of fun, both on and off the field, maybe too much fun. During a trip to the beach in 1926, Morrison broke his collarbone while bodysurfing. Although they did their best to conceal the nature of the injury from Coach Howard, Morrison lost his football scholarship and had to drop out of school. Bond went on to be a starting lineman on the National Championship 1928 squad. No longer attending classes, Morrison turned to his old soda fountain boss who had worked as a blacksmith, shoeing horses for the movie studios. Morrison was picked up as a prop boy and managed to get on camera sometimes as an extra. He became good friends with director John Ford and appeared in bit roles in a series of football-based films, including Brown of Harvard (1926), The Draw-Back (1927), and The Drop Kick (1927). When Ford decided to do his own football picture, Salute (1929), based on the Army-Navy Game rivalry, he naturally hired his young friend Morison, but for more authenticity he hired the entire USC football team, reuniting Morrison with his buddy Bond. 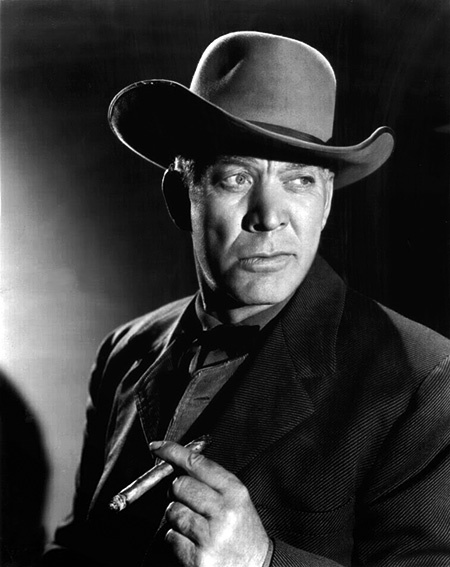 Ford promoted Ward Bond to a small speaking role while Morrison remained an extra but it was about the last time he would take a back seat to Bond. 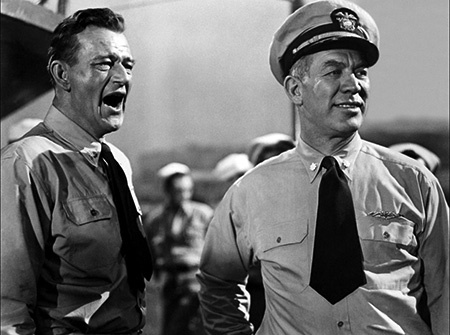 Director Raoul Walsh gave Morrison the screen name which would become immortal, John Wayne. Both Wayne and Ward Bond would cement their careers as part of John Ford's "stock company" and worked together on many occasions, they became very different Stars. John Wayne became an iconic leading man and was always very conscious of maintaining the image while gruff, rough and tumble Bond was satisfied to remain a supporting player. Personally, Ward Bond was a person who was either loved or hated, and he personally didn't seem to care what the other person's perspective was. He was, however, incredibly loyal to his friends. He appeared in 26 John Ford films and in 23 films with John Wayne, but that is just a small portion of his body of work. Although his career would be cut short by a heart attack at the age of 57, he appeared more than 250 films. He often appeared in ten to twenty films a year, he made more than 30 pictures in 1935 alone! 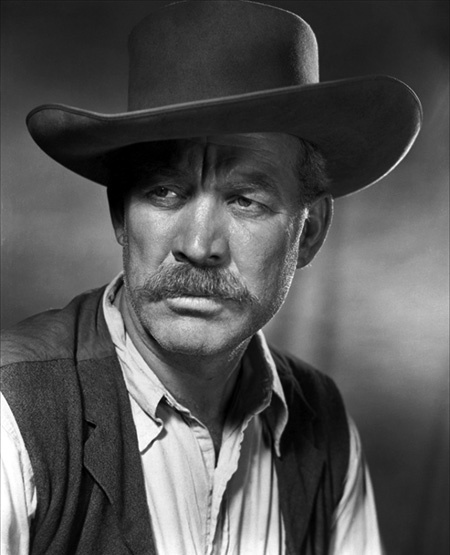 More Ward Bond films appear on the American Film Institute's "100 Years… 100 Movies" list than any other, albeit all in supporting roles. Standing an athletic 6'2", Bond was a natural authority figure, and he was usually typed as a friendly cop or a menacing tough guy. Despite the tough-guy persona he projected both on and off the screen, Bond battled epilepsy his whole life. The condition, along with his age, kept him from serving in WWII (John Wayne was also exempted for his age and a family deferment). Politically, Bond may have actually been to the right if the Duke. An avowed Anti-Communist, he was a member of the Motion Picture Alliance for the Preservation of American Ideals. He campaigned for Richard Nixon but passed away just three days before he was defeated by John Kennedy in the 1960 Presidential campaign. Although almost his entire film career had been as a supporting actor, NBC TV gave him a starring role in their popular Western series Wagon Train beginning in 1957. As wagon master Major Seth Adams, he helped to tell the story of countless ordinary people crossing the continent, and the show gained high ratings. There is an urban legend that singer Johnny Horton was to meet Bond in his Dallas hotel room on the day he died to discuss Horton joining the show. Ward Bond was in Dallas on November 5, 1960, to attend a football game when he had a massive heart attack in his hotel room and died around noon. At 1:30 that same morning, Horton had been driving from Austin to Shreveport, Louisiana, and was killed when struck by a drunk driver. Although the deaths occurred on the same day, they were unrelated. A Star on the Hollywood Walk of Fame at 6811 Hollywood Blvd was dedicated on February 8, 1960, honoring contributions to Television by Ward Bond. At Bond's funeral, John Ford walked up to Andy Devine to inform him "Now YOU'RE the biggest a**hole I know." I started my interest in radio programs in the late 50's listening to the last of the "Golden Age of Radio". I grew up in Eastern PA. I listened to all that were available. I worked at a local CBS affiliate at 16 when Johnny Dollar, Suspense, etc were still in existence. After my USN service in the late 60's & a move to Michigan I started to listen & collect again radio programs. I had them on LP's, cassettes & finally on discs. I have a collection of over 5,000 programs. Anyway, at home in my basement when listening to "OTR" I sit at an oak bar that my wonderful wife bought me, close by a "50's" beige rotary dial payphone. (I have another black one in my garage.) I was recently featured in the local newspaper about my listening hobby & collection. Thanks for your great collections made available to nuts like me! !